Most of these Windows utilities are freeware, but the TVwriter (write images back to memory card) requires registration. You can also register as a way of saying "Thank You". For the latest update information, you can get an e-mail delivered as frequently as you like. Click for an enlargement Windows program to convert JPEGs after processing in Paint Shop Pro, Photoshop etc. for TV slideshow display from your digital camera or on your large-screen TV. Make your slideshow from any JPEG file - camera original or edited. Yes, what many people have said was impossible can now be done with the help of TVwriter. Take individual JPEG files or even a complete folder of JPEG files and using simple drag-and-drop convert them into a slideshow you can carry around in your pocket on a Compact Flash or Smart Media card, and display on any NTSC or PAL compatible TV direct from your camera! Other digital cameras including the Canon 10D, G2, G3, G5, Pro1, S3 IS, S45, S100, S200, S300, S410, S500, Casio EX-Z55, QV-5700, Jenoptik JD 2300 Z3, Kodak DC4800, Konica-Minolta Z1, Nikon Coolpix P2, 950, 990, 995, 2100, 2200, 3100, 3200, 4500, 4800, 5000, 5700, 8400, D70, D70s, D700, S1, S52, S1000pj Olympus C-1 zoom, C-2100 UZ, C-220 zoom, C-2500L, C-3040 zoom, C-4000, C-5050 zoom, C-700, C-720 UZ, D-40 zoom, D-460, E-10, Panasonic FZ5, FZ20, LX3, Image Creator, Pentax Optio 330, Optio 430 RS, Sony DCS-F505V, DSC-P1, TRV-11, TRV-330, T3, T10 and W1 can read these images, as can some Pioneer and Sony TVs with a card or memory stick reader! It works on the Pioneer DVR-5100H DVD recorder as well. The registered version of this program has technical support, more facilities, a higher quality output, and doesn't have the "demonstration" text at the picture edges. "I really like the utility. It is very easy and fast and does the job with no fuss or bother." Warren Jason, registered user. How does TVwriter work? TVwriter operates by converting any JPEG image into a format that the camera can read, and saving that image in a temporary folder on your hard disk, from where you can copy it to your Compact Flash or Smart Media card for display in your camera. You can build up a slideshow using any software you like, although the program and my own SlideShow program listed below are well integrated. In addition to converting a single file, you can use drag-and-drop from Explorer to convert multiple files, and even one or more complete folders of images, for easy batch conversion with TVwriter. Why would you need TVwriter? While most cameras have no problem displaying their own images, once you edit that image - perhaps you need to rotate an image taken in portrait format, crop out unwanted details, or adjust the brightness, contrast or colour balance - the camera will no longer recognise that image and be unable to display it. The camera will also not recognise images such as captions that you have created yourself. This stops you making up a slide show for display with your camera. 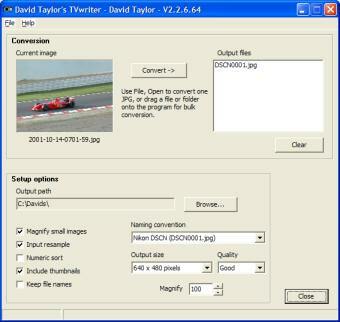 TVwriter converts such images into a format that the camera can display. V2.3.0 Add experimental 1280 x 768 output size. V2.3.2 Support Nikon D70, D70s, D700, Coolpix S1000pj, Olympus E-10, Panasonic LX3, Image Creator, correct thumbnail images. Processor - Pentium MMX or better required, AMD equivalents should be fine. Windows 2000 or XP (Windows 95, 98, ME and NT4 may work but are no longer supported). Cameras known not to work with TVwriter: Kyocera Finecam S4, Minolta Dimage S304, Dimage X1, Nikon Coolpix 775, Sony F717. Some display devices (including some Sony TVs) may have difficulty in displaying the thumbnails produced by TVwriter). The Nikon S52 only works without the thumbnails being included, and with converted images of 2048 x 1536 or smaller. Want to check if the pictures will play on your camera? Then e-mail me requesting a sample TVwriter picture (about 60KB). Please mention TVwriter in your e-mail! Windows program to make a slide show from a list of JPEG images. Slide sorter table, full-screen preview, high quality image resampling from digital camera etc. to screen size. V2.3.0 Display number of slides correctly when starting up, when closing a slide-show: remove file name from application caption and remove status line text, rename sorter form as "Slide Show Sorter"
V2.3.2 Accept JPEG as well as JPG file extensions, be more polite with bad files, warn if overwriting with File|Save as... dialog, position options dialog at main form centre. Program to display GINI format images received over the NOAAPORT system, and convert them to BMP format for subsequent import to other software (such as Digital Atmosphere Workstation). The program will run with full function for 30 days after download, but if you wish to use it after the trial period you will have to register the software, for which there is a small charge. GINIview has been tested as a Digital Atmosphere extension, via its scripting mode, and there are free sample scripts here => Projects, DA Scripts. (I haven't tested these myself, but I trust Jose!). V1.0.2 Accept -HISTO, -SAVE and -CLOSE parameters, -HISTO provides histogram equalisation, -SAVE saves the image as a .BMP file, -CLOSE forces the program to close, if -CLOSE specified the program runs hidden and errors will not stop the program, -SAVE can accept a filename such as -SAVE:picture.bmp, keystrokes <escape>, Q or q will close the program. V1.1.0 Add Windows Vista compatibility. V1.2.0 Add support for compressed files. Currently, if file extension is not .GINI, a ZLib compressed file is assumed. Input from users would be welcomed about the best way to access this new functionality. V1.3.1 Remove hardware locking requirement, support compressed data without the .Z extension, accept colour table, 256 pixels wide, 24-bit BMP (example supplied), accept text-mode colour table (256 lines of index R G B, index 0..255 in order, R, G, B each 0..255, little error checking, example supplied. Simple image viewer for Windows with high quality display of images even on 256-, 32K and 64K-colour adapters. Displays TGA, JPEG, GIF, WMF and BMP files. You can add this to your SendTo menu to have a simple way of viewing images. Why yet another image viewer? This one provides a much higher quality display on 256, 32K and 64K colour video adapter boards that may be found in older PCs. V2.2.0 Fit to screen dimensions a little better, provide right-click option for full size (JPEG only), convert relative file name to full file name, don't require the run-time library package. V2.2.2 Centre display better, fix height when unzoomed problem. Windows program to check the setup of your display. In an ideal system, all the numbers in the white and black areas should be visible. The more numbers near the extremes of the brightness range you can see, the better your setup. Enjoy! The program has two areas, black and white, and in each area low contrast text is displayed. The program saves the bitmap it produces as a files Grey.bmp and Grey.png in its current working directory. V1.1.0 Version for Delphi 5. V1.3.0 Remove requirement for separate runtime library, version for Delphi 2007.